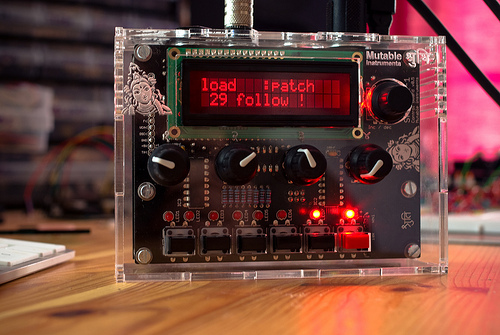 The MeeBlip and Shruthi-1 both answer the same question — just how much of a synth can you build on top of a low-cost Arduino-style platform? The MeeBlip squeezes an analogue-style two-oscillator monophonic synth on to it’s tiny 8-bit AVR CPU, and while the sounds may be digital, the interface is very old-school. It’s eight knobs and sixteen switches give you direct control over the sound, and it’s a good thing, too, since the MeeBlip lacks patch storage. The more expensive Shruthi-1 has less direct control, but it does have patch storage, and quite a few more sound generation options. 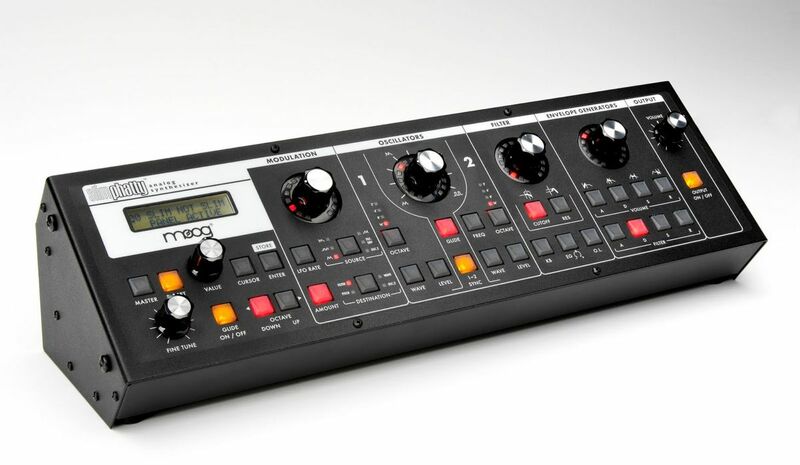 Like the MeeBlip, it’s a monosynth that runs virtual oscillators on a bargain CPU, but it augments those digital sounds with an analogue low-pass filter. Not only does that give you some genuine analogue feel, and the ability to filter sound from external sources, but it also leaves more CPU power for the virtual oscillators. That lets it cover more ground: while the MeeBlip has just saw and pulse waves, the Shruthi-1 adds super-saws, sweepable wavetables, vocal formants, and CZ-style phase distortion. What both synths share is their design philosophy: both are completely open, with the hardware designs and the firmware source code available under open licences. If you have the means, you can source the parts, grab the firmware, and build your own synth from scratch; for the rest of us, both synths are available in kits with all of the bits you need. As more of these synths get in to the hands of developers, it’s going to be very interesting to see what new features find their way in to their firmwares. Korg surprised the hell out of everyone when it announced the Monotron — the last thing anyone expected from Korg was a 100% analogue synth for US$60. The Monotron is incredibly simple: there’s a single sawtooth oscillator, a low-pass filter (based on the filter from the venerable MS-10), an LFO for modulation, and a ribbon controller for input. There are no envelopes, and definitely no MIDI, but it’s still capable of some crazy sounds, and like the Shruthi-1, its filter can be used to process external audio. The Monotron is capable of far more impressive things in the right hands, though, because its hardware is remarkably hackable. Korg recently released the synth’s circuit diagram, but it hardly needed to — the Monotron’s design is so clean and simple that it had been hacked by the community even before its official release. Still, Korg should be applauded for embracing, rather than discouraging, the modding community that that Monotron has inspired. Many of the hacks involve adding external control systems — YouTube is awash with videos showing Monotrons under CV/Gate control from PCs using MIDI-to-CV/Gate converters, or under more direct control from custom Arduino-based boards. More intrepid hackers have gone beyond pitch and gate controls, adding external control of the filter, extra oscillators, and distortion circuits, among other things. While these new synths are bringing hardware down to software prices, the thought of assembling a synth from parts is, admittedly, a bit intimidating. Thankfully, mainstream instrument-makers are also delivering some remarkably affordable synths, even if they’re not quite as bargain-priced as the DIY options. The Alesis Micron and Korg microKORG both give you small keyboards and virtual-analogue sound on a budget, the DSI Mopho squeezes an analogue monosynth in to a tiny box, and the DSI Evolver delivers unique hybrid analogue/digital crazyness. Even Moog is getting in to the game with the Slim Phatty — US$849 isn’t exactly cheap, but for an honest-to-goodness, 100% analogue Moog synth, it’s a bargain. I still think that the Waldorf Blofeld — my synth of choice — is a great option, too, especially at its current second-hand prices. It covers a great range of sounds, from bread-and-butter analogue sounds through to distorted wavetable madness, and it has enough polyphony in multi-mode to run an entire track’s worth of sounds at once. Linux soft-synths are certainly improving, but if you’re serious about making electronic music under Linux, you owe it to yourself to check out some of these affordable hardware options. This entry was posted in Music, Technical and tagged blofeld, dsi, evolver, meeblip, microkorg, mircon, moog, mopho, shruthi-1, slim phatty, waldorf by lsd. Bookmark the permalink. Vermona Mono Lancet (449.-) plus optional expansion, Doepfer Dark Energy (398.-) and MFB’s Nanozwerg (220.-) and Microzwerg (380.-), Prices in Euro. Yep, those are definitely worth a mention, too — I often forget to mention them, since they’re not as easy to find here in Australia as the American analogs from DSI and Moog, but from what I’ve seen and heard of them they’re also excellent options. I especially like the idea of the patchable synths, like the Microzwerg and Dark Energy — the Dark Energy in particular looks like a great, affordable way to make a start in the world of modular synths. It’s awesome to see so many affordable hardware options out there! Similar to the Meeblip and Shruthi in homegrown style if not in price and not “open” are the Gotharman synths. Thanks for the links to the Gotharman synths, they definitely look interesting 🙂 Open or not, it’s very cool to see what the low price of these embedded platforms is enabling both artists and engineers to build.